Open since 1927, Mala Mala Game Reserve is a 130km2 (15,000) game reserve, running safaris and to see Africa’s big five (5) wild animals. It’s the largest and oldest game reserve and a popular South Africa safari destination. The big five include the Buffaloes, Rhinos, Elephants, Lions and Leopards named so because of the difficulty in which hunters faced in tracing them down during their hunts. The name Malamala means Kudu, deriving the name therefore for the abundance of the Kudu within the game reserve. Mala Mala Game Reserve is located in Mpumalanga province bordered by the Sabi Sand Game Reserve and Kruger National Park without fences on both sides. Almost unrivaled with the big five sighting, at Mala Mala Game Reserve, there is guarantee for an almost magical sighting of the big five on great off-road game drives that allow close animal encounters. However much geographically Mala Mala Game Reserve is part of the Sabi Sand Game Reserve, the reserve is an independent private game reserve with the largest property on Sabi Sands with extensive river frontage. The Sand River flows north to south through the park for 20km/13mi and attracts abundant wildlife in the Dry season. The coverage of the park is made up of woodland savannah, dense riverine forest, acacia bushveld, open grassland and rocky outcrops in which wildlife thrives. Many popular game reserves are owned by the government however, this isn’t it for Mala Mala Game Reserve. The Sabi Sand Game Reserve was proclaimed in 1902. In 1922 the farm MalaMala was acquired by the Transvaal Consolidated Land and Exploration Company (TCL). Later on, the National Parks Act was passed in 1926 in which the Sabi Game Reserve was effectively reduced by about half, resulting in the Kruger National Park in its current form. By then, the land to the west was now open to private ownership. This land had proven to be useless for farming though its value as a wildlife haven was being recognized, and individuals bought properties to be used privately for game viewing, relaxation and hunting. In 1927 William Campbell bought Eyrefield and in 1929, MalaMala. Two years later, on the 17th September 1962, Campbell died and MalaMala passed to his son Urban. From then the camera replaced the gun and Africa’s first photographic safari destination was born. Later on, Urban sold MalaMala in 1964 to a company named MalaMala Ranch (Pty) Ltd. 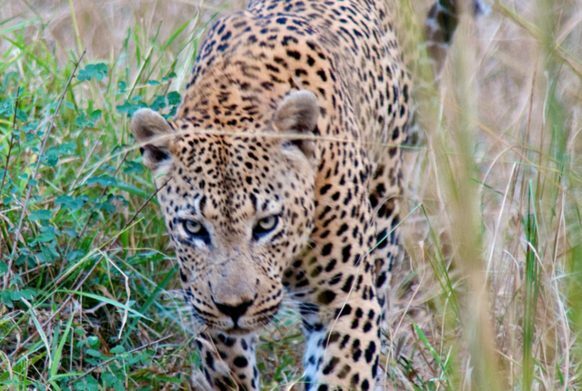 Surely the home to big five wild animals, Mala Mala’s main attraction is the habituated Leopard. This is the best wildlife viewing reserve for the big cats and being able to follow these normally elusive cats on game drives provides fantastic opportunities to see very rarely witnessed behavior. On top of the Buffaloes, Rhinos, Elephants, Lions and Leopards, there are also wild dogs within the reserve. The most interesting part of the game drives at Mala Mala Game Reserve is that all game drives are exclusive to only Mala Mala since the reserve doesn’t give traversing rights to other properties as it is with Sabi Sands reserves. The exclusiveness offers quality sightings on a South Africa wildlife safari in the reserve as you are allowed to spend more time without having to move on to make space for other vehicles. Only three vehicles are allowed per wildlife sighting. Any time can be safari time but just like anything else there is always the best time for everything. The best time to view wildlife in Mala Mala is the Dry season which is between June and September. The end of the Dry season, from August to September is especially good since temperatures are warmer than in mid-winter and wildlife concentrates at predictable water sources. Wildlife reserves are one kind of wildlife viewing surprises in Africa. On a Kenya safari, one can’t go without visiting the famous Maasai Mara Game Reserve filled with wildlife including wildlife that cross over from the popular Serengeti National Park in Tanzania. On Uganda safaris too, game reserves are the best way of getting to see wildlife off the beaten track since many tourists opt to go and visit the national parks.